Headline inflation as measured by the year-on-year change in the National Consumer Price Index (NCPI, 2013=100) increased to 2.9 per cent in March 2019 from 2.4 per cent in February 2019 mainly due to the low base prevailed in the corresponding month of the previous year. Meanwhile, in March 2019, year-on-year Food and Non-food inflation recorded -2.3 per cent and 7.1 per cent respectively. The change in the NCPI measured on an annual average basis remained unchanged at 1.7 per cent in March 2019. In February 2019, the deficit in the trade account narrowed further to US dollars 451million, recording the lowest monthly trade deficit in more than 5 years. The considerable reduction in the trade deficit was due to the notable decline in import expenditure by 27.6 per cent (year-on-year) and increased earnings from exports by 7.2 per cent (year-on-year) in February 2019. Workers’ remittances declined by 12.4 per cent (year-on-year) in February 2019, to US dollars 500 million. In January 2019, the trade deficit continued its improving trend observed in recent months. The trade deficit was recorded at US dollars 617 million during the month, compared to a deficit of US dollars 701 million in December 2018, and US dollars 1,049 million in January 2018. This significant reduction in the trade deficit was due to the combined effect of higher earnings from exports and a notable deceleration in import expenditure. Exports grew by 7.5 per cent while imports declined significantly by 17.8 per cent in January 2019 (year-on-year). Tourist arrivals grew by 2.2 per cent (year-on-year) in January 2019, resulting in earnings from tourism of US dollars 458 million during the month. Manufacturing activities accelerated in March 2019 compared to February 2019. Manufacturing PMI reached a 46-month high and signalled a surge in manufacturing activities. The increase of PMI in March was largely attributable to increase in New Orders in line with the seasonal demand, especially in manufacturing of food and beverages. The Production also increased significantly, with the intention of achieving expected production levels ahead of the new year holidays in April. The Stock of Purchases and Employment also increased during the month in line with tight production schedules. Most respondents, especially in textile and apparel sector, highlighted that they had to work overtime in order to timely fulfil the orders ahead of festival holidays. Further, lengthening of Suppliers’ Delivery Time also contributed positively to the overall increase. 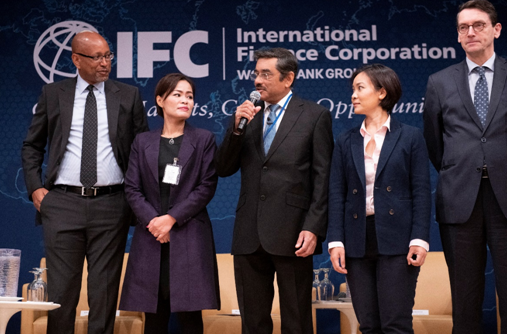 Central Bank of Sri Lanka launched a Roadmap for Sustainable Finance in Sri Lanka on 10 April 2019 at the Sustainable Banking Network Global Meeting of the International Finance Corporation (IFC) in Washington, D.C, USA. The Monetary Board of the Central Bank, at its meeting held today, 08 April 2019, decided to maintain policy interest rates at their current levels. Accordingly, the Standing Deposit Facility Rate (SDFR) and the Standing Lending Facility Rate (SLFR) of the Central Bank will remain at 8.00 per cent and 9.00 per cent, respectively. The Board arrived at this decision following a careful analysis of current and expected developments in the domestic economy, the financial market as well as the developments in the global economy, with the broad aim of stabilising inflation at mid single digit levels in the medium term to enable the economy to reach its potential. The Central Bank of Sri Lanka will open a Counter at the ground floor of the Central Bank Head Office Building, No.30, Janadhipathi Mawatha, Colombo 01 on 27 March 2019, to issue coins to the general public. This counter will be opened for the public from 9.00 a.m. to 11.00 a.m. on every Wednesday and Thursday, except public and bank holidays. Headline inflation as measured by the year-on- year change in the National Consumer Price Index (NCPI, 2013=100)1 increased to 2.4 per cent in February 2019 from 1.2 per cent in January 2019 mainly due to the base effect. Meanwhile, year-on-year Non-food inflation increased to 6.7 per cent in February 2019 from 6.5 per cent in January 2019 while Food inflation also increased to -2.9 per cent in February 2019 from -4.8 per cent in January 2019.